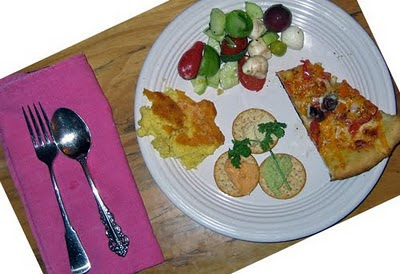 Cornbread Suppers: Cornbread Supper, February 22, 2010: Food styling! Cornbread Supper, February 22, 2010: Food styling! 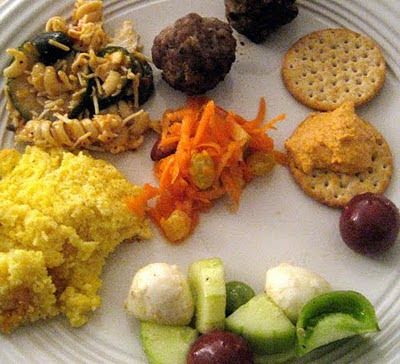 Another Supperian, DE, styled a beautiful plate, too, centered on a brilliant carrot salad, with Greek meatballs in the 12:00 o'clock position, and a chicken-pasta dish at 10:00 o'clock. Your documentarian appreciates the interesting and intriguing wine varieties that show up each week. For this week, a bottle of Elm Tree Argentine Malbec played well with the Greek Meatballs and their awesome Taramor sauce. A lovely squat carafe of Shiraz also tasted delicious. Someone brought a bottle of Lovers Leap "Cynthiana," which will be opened at an upcoming Supper.